At EVE Vegas 2018, we announced that work had begun on the transition to a 64-bit client. We’re now happy to announce that this project is seeing rock solid progress and we’re aiming for a Q2 2019 release. The aim of this project is twofold – continued investment in the future of EVE Online with regular technical upgrades, as well as efforts to ensure that New Eden remains as visually stunning as ever, on the cutting edge of what’s graphically possible for an MMO (when you’re not playing in potato mode). Right now, the audio and graphics team are deep in the testing phase in preparation for a public test on March 5th, which is when you’ll be able to get your hands on the 64-bit client for the first time by connecting to the Duality test server. We’re super excited about the move to a 64-bit client as it represents a key modernization moment in the development of EVE Online and is substantial milestone in our drive to move with industry standards and continue to streamline our development maintenance costs. With the switch to a 64-bit client we have decided to drop support for the 32-bit client, given that only around 0.5% of our pilots are currently playing on 32bit operating systems and the cost to support both architectures isn’t where we want to invest our development time. To facilitate the switch to 64-bit client architecture, we’ll also be looking to change the minimum requirements for EVE Online. The nature of 64-bit applications means that they utilize more memory. As such, we’ll be increasing then minimum memory requirements for EVE Online from 2GB to 4GB when we release the 64-bit client. As we continue to invest in the future of one of the most iconic and beautiful sci-fi MMOs, we need to lay the groundwork for future technologies. 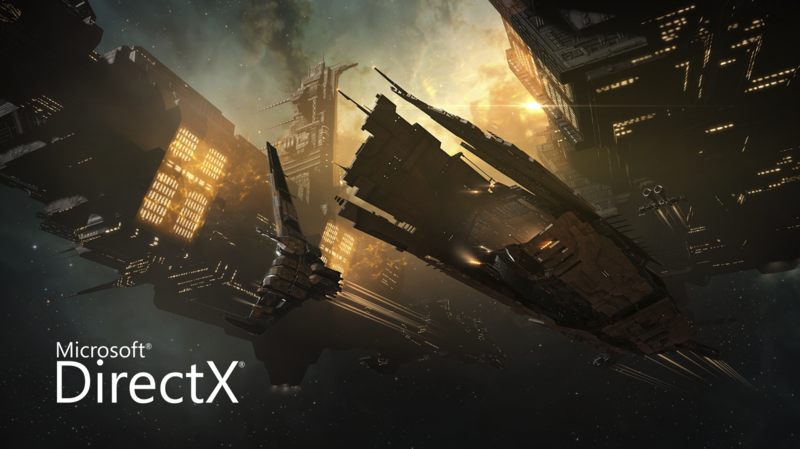 We’re excited to announce that our engine team have started work on the substantial task of providing DirectX 12 capabilities for EVE Online. Switching to DirectX 12 will give us a huge increase in bandwidth to utilize more modern advances in graphics technology to continue to make New Eden more stunning than ever before. With DirectX 12 we’ll be able to use technologies such as DirectX Raytracing, and will be able to invest more time into overhauling effects, environments and visual feedback in EVE Online to provide an even richer and more immersive experience for all our pilots. Since 2016, we’ve hinted at the eventual sunsetting of DirectX 9, and more recently we reset EVE Online’s default DX API to DirectX 11 to gauge how many of our pilots would switch back. The results of this experiment coupled with the decision to invest in continued future proofing by moving to DirectX 12 means that we’ve made the decision to sunset our support for DirectX 9. The date for the sunset of DirectX 9 will of course be tied to the release of the DirectX 12 client, which will be announced at a date to be decided in the future. 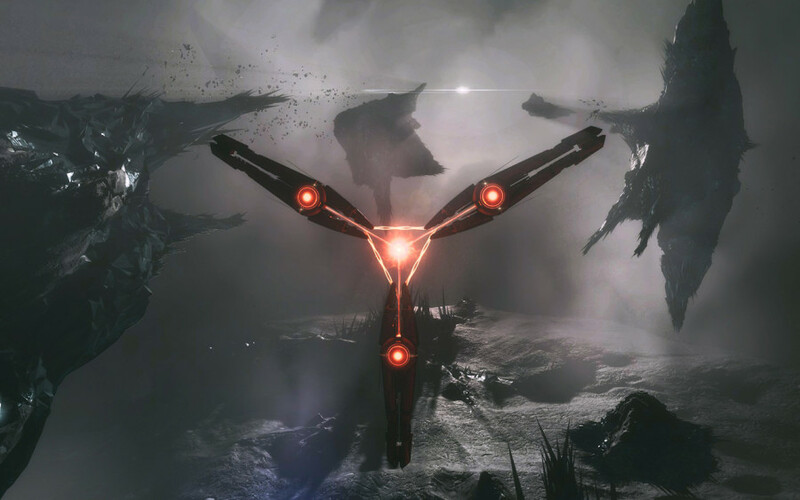 The transition to a 64-bit client will of course come first, but you can expect us to keep you updated on progress of the transition to DirectX 12 after that via dev blogs and more information at EVE World Tour events during 2019. The release of a DirectX 12 client will mean that all pilots will need a DirectX 11 capable graphics card as a minimum requirement to play EVE. We understand that this is a leap from a DirectX 9 capable card for some of our pilots, and we’ll be sure to give at least six months of notice before the transition to DirectX 12 so that there’s ample preparation time, should hardware upgrades be needed. One question does of course remain – what about those pilots who’re playing on the Mac client? Fear not! We’re currently working with our partners to ensure that all the above also applies to the mac client too. We’ll have more information for our mac users as soon as we’ve made more progress with the Mac client and are ready to talk more about transition plans for those playing on macOS. As we mentioned earlier in the blog, we’ll begin public testing of the 64-bit client on Duality, on March 5th. We’d love to have as many pilots as possible helping to make sure that everything is running smoothly and providing feedback on performance and any issues that might be encountered. We’ll have more information on how to connect to Duality and how to get involved once testing commences. For now, if you have any feedback or comments, then we’d love to hear from you all in the comments thread for this blog. That’s it for now – we’re looking forward to seeing many of you on Duality next week. Pretty c post. I just stumbled upon your blog and wanted to say that I have really enjoyed reading your blog posts. Any way I’ll be subscribing to your feed and I hope you post again soon. Big thanks for the useful info. There is evidently a bunch to realize about this. I think you made certain nice points in features also. I in addition to my guys appeared to be digesting the best helpful tips on your website and then the sudden came up with an awful feeling I never thanked the web blog owner for those strategies. All the young men appeared to be totally passionate to see them and have in effect without a doubt been having fun with those things. We appreciate you getting really accommodating as well as for deciding on variety of great useful guides millions of individuals are really desirous to know about. My honest regret for not saying thanks to you earlier. You really should be a part of a tournament for just one of the best blogs on the internet. I will recommend this page! All movies in 123movies in full HD and completely free. 123movies has more than 50,000 movies in best quality for you and you must pay nothing to watch it. Just want to say your article is as surprising. The clearness in your post is simply spectacular and i could assume you’re an expert on this subject. Fine with your permission allow me to grab your feed to keep up to date with forthcoming post. Thanks a million and please keep up the rewarding work. Hiya, I am really glad I have found this information. Today bloggers publish only about gossips and internet and this is actually annoying. A good blog with exciting content, this is what I need. Thanks for keeping this site, I’ll be visiting it. Do you do newsletters? Cant find it. A person essentially help to make significantly posts I would state. This is the first time I frequented your web page and up to now? I amazed with the research you made to make this actual post extraordinary. Magnificent job! What hosting sites will permit my blog site to generate income off includes being put on my blog site? Do you blog? Do you blog site to advertise products you are selling? I am instead new to the blog writing globe. I primarily blog to market items that I am offering and also websites that I am marketing on. Exactly how do I obtain traffic to my blog? Do I generally just require to add web content? Does my blog obtain picked up in the search? Any type of guidance on blogging is significantly needed. Hey there, yes I state it on my twitter account and also my various other web-sites. I am not certain the place you are getting your info, however great topic. I must spend a while studying more or figuring out more. Thanks for excellent information I used to be in search of this info for my mission. Hello my family member! I want to say that this article is amazing, nice written and come with approximately all significant infos. I¡¦d like to peer extra posts like this . I am also writing to make you understand of the fine encounter my wife’s girl encountered going through your web page. She discovered a good number of issues, which include how it is like to possess a wonderful giving heart to let other individuals just fully grasp specific advanced topics. You actually exceeded our own expected results. Many thanks for coming up with such warm and helpful, trusted, explanatory and as well as cool thoughts on that topic to Janet. Whats Happening i’m new to this, I stumbled upon this I’ve found It positively helpful and it has aided me out loads. I’m hoping to give a contribution & aid different customers like its helped me. Good job. I do believe all of the ideas you have presented for your post. They are really convincing and can definitely work. Still, the posts are too quick for newbies. May just you please prolong them a little from subsequent time? Thank you for the post. What i don’t realize is if truth be told how you are now not actually a lot more smartly-liked than you may be right now. You’re so intelligent. You know therefore considerably with regards to this topic, produced me in my opinion consider it from a lot of varied angles. Its like women and men are not fascinated until it is something to accomplish with Girl gaga! Your individual stuffs excellent. At all times take care of it up! UOSgNf watch out for brussels. I all appreciate if you continue this in future. Your style is very unique in comparison to other people I have read stuff from. I appreciate you for posting when you’ve got the opportunity, Guess I will just bookmark this web site. Leave a Reply to computer pc Click here to cancel reply.